The Rice Diet is the basis for a medically-supervised, live-in program designed for rapid weight-loss over a period of 2 to 4 weeks or more, in the treatment of obesity, diabetes, heart disease, hypertension, and renal disease. The program operated as part of Duke University in Durham, North Carolina, USA. The clinical version of the Rice Diet was recently terminated by Duke after 70 years. However, this plan is also available in book form in The Rice Diet Solution. The originator of the Rice Diet was Walter Kempner, born Germany 1903, who joined Duke University’s Department of Medicine in 1934. Kempner investigated the effect of diet on diseases including hypertension and diabetes, and found that they were rarely problems for people using rice as a staple food. Kempner developed a diet of rice, fruit, juices, sugar, plus vitamin and iron supplements to help people with these and related health problems. The Kempner diet or Rice Diet has been used since 1939 in treating, often with dramatic results, more than 18,000 patients from around the world suffering from diabetes, obesity, heart disease and hypertension. The Rice Diet is not like fad diets which come and go, but has developed into a complete, proven and well-respected program for improving health. As well as meals using the Rice Diet, the program provides classes, groups and workshops for stress management and exercise, nutritional lectures, and personal medical supervision. Participants in the program have a limited menu selection initially, then choose from a range of items comprising fresh fruits and vegetables, grains, fish, and legumes (beans), varied daily. The name Rice Diet is somewhat confusing (the diet origins being the study of rice as a staple), as more than 30 food items are available, including a number of rices. 1 Dairy = 1 cup milk, 1 cup yogurt, or 1/2 cup cottage cheese. Salt is restricted in the Rice Diet, since the body swells with salt (sodium) and water. Most people’s diet contains approx. 4-7 grams of sodium, yet less than half a gram a day is necessary for normal body function. Salt is a problem for patients with high blood pressure and kidney failure, and this is true also for most people if present in higher quantities in the diet. Salt stimulates the appetite, whereas herbs and spices simply flavor the food. Limiting salt reduces several health risks, including cholesterol, blood pressure, heart size and weight, as well as reducing the need to medicate for these problems. As well as being low-salt, the daily diet contains 5 grams or less of fat, about 20 grams of protein, and not more than 150mg of sodium. On completion of the program, resources are available for participants to continue with a healthy lifestyle, and to maintain the improved health gained while on the residential program. You guys are a bunch of drama queens. The diet works. It was developed and used at Duke University. Do your research and follow the plan. I have been on the rice diet now for 10 days. I have lost 13 pounds. I am also hypo-thyroid, so this is a miracle for me. I am logging my progress on sparkpeople.com which calculates my calories, carbs, protein, & fats. Only on the one day a week “fast”, am I low on protein. I’m also eating quinoa, and spitting up my 3 starches between rice and beans or something like that. My calories are around 1000-1300. Daily Protein for me on this diet is at 59 grams (RDA 60 grams). This protein count is with out regular milk drinking Almond milk instead. I’ve been doing Kim Voit’s 7 day routine for exercise, walking or just yoga sans meditation. Being an Orthodox Christian, we eat like this almost half the year anyway, so now I can still diet and fast for Lent, Advent, etc. I love this diet. I felt healther, fuller, and even slept better. This is NOT truly a DIET. It’s a DIETA – or way of life. It teaches you how to eat healthy and it has come a long way since the 1970’s. I have done a load of research and if you follow it you WILL lose weight in a very healthy way because you’re not only loosing weight by having a low amount of calories. You also have to exercise. Does this take discipline? YES! But any diet out there does. As does any exercise routine. 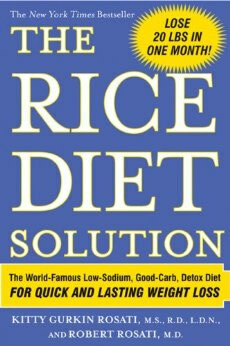 Please, read ALL of the material out there about the Rice Diet Solution BEFORE you actually try it because if you don’t know what you’re really getting yourself into you will NOT succeed with it. But, that’s true even if you are on Weight Watchers, Jenny Craig, or any other fad diet out there. I usually eat between 1200-1400 calories a day and I feel great and lose weight. Everyone must find a diet that works for them. I have done many diets in my life, but for the past 12 years, anytime I need to loose 10-15 pounds, it is my top choice. I even think it is healther than the average american’s diet. I really do not like a lot of meat and i like to get the weight off fast. Yes, i do tend to put on 10 or more over the holidays every year, but I am glad I know about the rice diet. Good luck finding a diet that works for you. Since last Tuesday I’ve been doing the rice diet. I cheat (eat things I shouldn’t way too often), but I also keep track of calories and get plenty of water. I haven’t been able to exercise as much as I would like because of a chest infection, and am still down about six pounds since last Tuesday. No diet is perfect for anyone person, and the most difficult thing for me is trying to put enough variety into eating all these vegetables. So far, I’m thinking it’s a good choice for me. Im quite young but old enough to make my own decisions. As well as this im chubby so have been suching the web for good diets, and iv seen alot of bad diets that do cause damage to people. However if u do this for a certain amount of time say a couple of weeks i think that will show u u can loose weight and give u the driving seat to become fitter. This is an okay diet if u use common sense when to stop. This shouldnt be done perrminatly but should be changed into another health diet but that isnt as drastic. When u loose a certain amount of weight stop it! U should lisen to ur body. An idea is to go check with ur GP. i wish everybody the best of luck but my advise use this diet as a motivater not a way of life or things are just going to get worse. I have done this plan in the past. It does work. I would weigh in each day and found that each day I lost a pound. However, I had gone back to my former way of eating, and gained back what I lost. So, here I am now looking over diet plans and thinking of doing this one again. Its easier if you have support, like a spouse or other family member. That way, you are only cooking what SHOULD be eaten. I’m modifying it a bit by adding a handful of nuts at lunch for a little protein, seeing as I really need to lose about 15 pounds and any more would be unhealthy. I don’t think this diet is dangerous. It may be low calorie, but that’s what’s required to lose weight. Once I get the weight off, I plan continue with rice and vegetables as a meal staple along with heavy exercise (I’m running cross country) to maintain my weight. I’m ready to start a diet but very difficult to do it alone. looking for friends or join a team. I just did the phase II, skipping the phase one. I added a bit of olive oil each day, maybe a tsp, and didn’t always do the cleansing day. Of course, i didn’t just eat rice – you can have any whole grain pasta, couscous, etc. I got creative cooking with fruit, and lost 25 pounds in 12 weeks, which is nothing short of miraculous for this former Weight Watchers lifer, where weeks could go by and maybe I lost a pound or two. This was a great diet for me. I still need to lose more, but I have to say I feel great. I really needed that olive oil, though…. The rice diet is amazing. I did it for a week and 1/2 and lost up to about 12 lbs. Its the most effective plan I’ve ever been on. The reason why I only did it for such a short time was because I did it with a partner when she had a big mac I figured why should I keep going. STUPID. So I started again today. Yes your first week will be hard. But you’ll love the results its worth it. When I noticed my face was no longer pudgy, I was happy. If you are considering going on this rice diet plan def. go for it. Don’t give up on the second day give it a week and you will not want to stop because you will be seeing the pounds drop! In the early 1970s I became the youngest person ever admitted to the “rice house.” It is a very dangerous diet. At that time we were given only small amounts of rice 2xday. After months,we received bit of tomato sauce on top. I never saw any fishand would have gotten on my knees and beggedfor a piece of fruit. I was so low on nutrients that fainted and fell into the bath tub. Iam now in my 50s and have battled my weight all my life because this diet ruined my metabolism. I warn all of you to go with a more moderate diet plan. This diet ruined my health and well-being.Take care and use your common sense. I think this diet is maybe a good choice for me. See, I live in Asia and eat rice but I am slightly overweight. Now, I realize I need to reduce the quantity of food I eat. Wish me luck! so every type of fruit is ok ? I have been on this diet before,it was twenty years ago but did not have any problems health-wise.I think my health improved. I’ve had the Honor of meeting some Gentlemen who were on a rice diet for 3 yrs on average- as Prisoners of War of the Japanese. They are still suffering the effects of it today. Read about Bataan or Corrigedor & you will learn about a rice diet. Im pretty sure people hailing from the Asian continent have been eating rice for a very long time, and before the days of mass production and intensive farming, just 1 bowl a day would suffice, albeit a big bowl. using this as a tranition diet is fine then moving to exercise and veggies and fruits is awesome but sticking to this diet is DANGEROUS and can cause physical and emotioinal illness (fun fact just like being dangerously over weight or obse) so i say u choose but be smart and don’t live on it for the rest of ur life. The Rice Diet is dangerous. It restricts calories to very low, and destroys the metabolism in the process. If you’ve followed it for awhile, and that takes ENORMOUS discipline, if you go off of it you will gain back all the weight and then some VERY quickly because your metabolism has simply been destroyed. It’s not healthy, even though it was developed BY ACCIDENT by a physician and is still a big money maker at The Rice House. That doesn’t make it good for your long term health–it just makes a a drastic weight loss diet that a lot of people have paid big bucks to follow. Almost no one can follow it without being at The Rice House to the tune of over $5,000 a month. YOu should check your facts more carefully before publishing. The Rice Diet does not limit sodium to 150mg, that would be dangerously low. The Diet limits sodium to 300-500mg in the first week, then 500-1000mg afterwards (p.24, The Rice Diet Solution). That looks like a pretty delicious program.